It has been a few years since I wrote about beer from a specific region of France. The last time was Normandy in 2010. In my first real visit to Brittany, I discovered something interesting. Brittany has its own language. I always took from the name that "Brittany" must have something to do with "Britain" just by how it sounds so it was interesting to look in to that a little. The Britons were Celtic tribes living on the island of Great Britain. They are distinct from the Picts of what is now north and east Scotland and the Gaelic tribes of Ireland, west Scotland and the Manx (Isle of Man). This just goes to show I was completely ignorant about the region because as it turns out, Brittany shares a lot in common with Ireland. Both of us are among the 6 celtic nations of Ireland, Wales, Scotland, Brittany, Cornwall and the Isle of Man. Who says you don't learn anything while drinking beer? I was fascinated to see stickers on cars all over Brittany with an image of a girl in a top hat with the words "A l'aise Breizh". There's a clothing brand of that name but this sticker seems something more. There's a hint of nationalism about it I think. It seems that some of the Breton people might not like being part of France? Anyway, I've digressed enough, back to the beer. Lancelot is a Brittany brewery that had a 7 beer variety pack for sale so I nabbed it. The blonde is a nice 6% ABV Belgian style blonde. Nothing out of the ordinary and I enjoyed it a lot. I'll just list the other beers with a few quick notes below. Morgane: 5.5% Sorty of flowery blonde. Not bad but not as good as the first blonde. 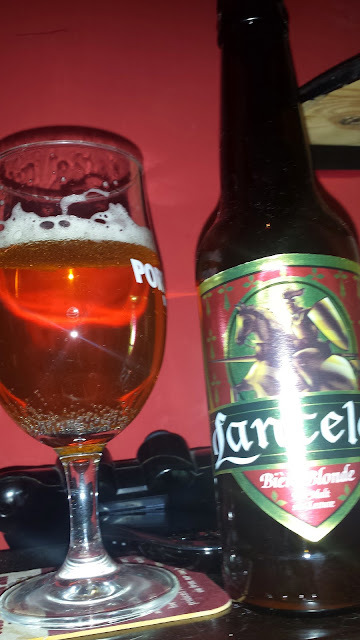 Cervoise lancelot is a 6% Belgian amber type beer. Nice enough. Lingering sweet and bitter with a little honey and flowery aroma. Bonnets Rouges is a 5.5% fruit beer of some kind. This one came in a clear bottle for some reason and was very skunked as a result. Duchesse Anne is a 7.5% trippel. It's a rather nice beer that reminded me of Duvel. Still on Lancelot, Telenn Du is a 4.5% dark ale. I found it watery with some coffee and a little oxidation. I think there was also a witbier in the pack but I don't recall it and didn't write any quick notes. 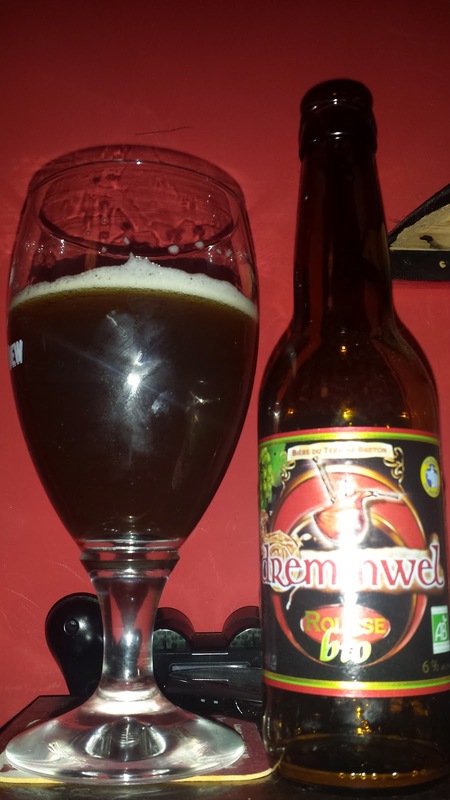 To Brasserie Britt now, Dremmwell Rouse Bio is a rather nice red ale. I found it had a slightly smoked aroma. It tasted quite winey with a fair bit of alcoholic warmth. I actually had this on tap and I found it a bit better on tap. It didn't have the smoke but it just worked a little better than the bottle. probably the extra carbonation or perhaps because it was filtered versus bottle conditioned. From Brasserie Kerav'Ale, I got another mixed pack. Eost Du is a 4.5% sort of sour dark wheat beer. It's not bad, just a little odd. 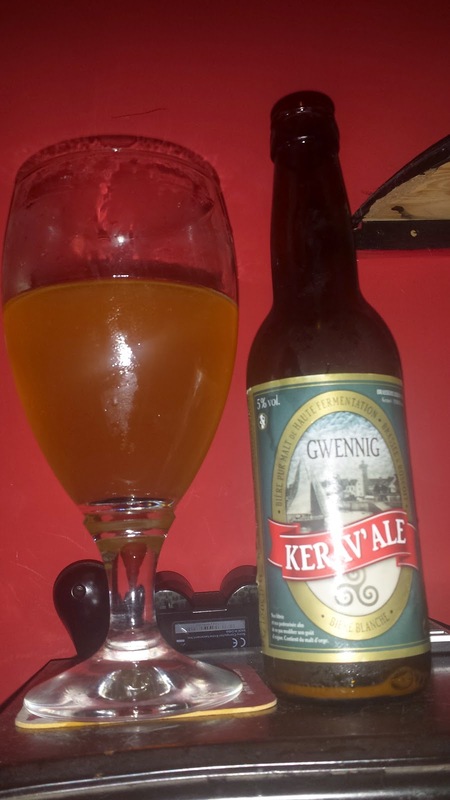 Gwenning is a 5% sour witbier with refreshing lemon. Very tasty I thought. Bloscon Best Bitter is a 6% supposedly English style best bitter, though bigger than most and not so much English as a French or Belgian take on one. Caramel is expected but lots of candi sugar in there too. It's a little bitter with slight sour finish. Rosko Ambrée is a 4.5% beer quite similar to best bitter but much lighter and less sweet. It also had a slight sourness. All of the Kerav'Ale beers had a slight sour thing going on. That means either every beer was somewhat infected, or they just like to produce sour beers. There were a few more that I didn't jot down any notes for but but from memory, all had a slight sour twang which worked nicely for all of the beers. I have a little more French beer to get through at a later date.